We've relocated the Bertazzon & Bertazzon America web site to www.bertazzon-america.com. Car standard features include hot-galvanized steel frame, car body with multi-color paint fused into the fiberglass, protected electrical system, available with floor pick-up system, token acceptor and a variety of standard themes including: Antique Car, Cat, Mouse, Buffalo, Cow Boar, Ram, Horse and new Laser Tag Bumper Car Systems specially designed for interactive battles. Buildings also include hot-galvanized steel frame, lots of flash. Available in a variety of sizes from 4.7 meters (15.5 feet) to 14 meters (45 feet), and even a breathtaking 2 story model. 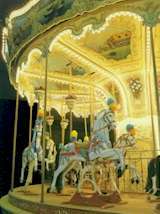 All versions include hot-galvanized steel frame, ball bearing mounted rotating components, and hand painted decorations, horses and scenery panels in the classic 18th century styling of nearby Venice or to your personal specifications. Known by many names, the classic Matterhorn ride arouses the same intense emotions as those experienced during a wild bob-sled run. 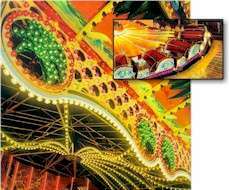 The customizable scenery, painting and lighting make this ride a show piece whether it be at a park or fairgrounds. 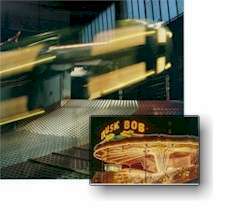 The hot-galvanized steel structure, electro-hydraulic controls and moving system ensure that this will be a low maintenance, money maker for any park or carnival. Check out the new Rock-N-Roll theme. A traditional yet dynamic ride with timeless appeal that continues to attract a broad range of riders from thrill seeking teens to adults and families. 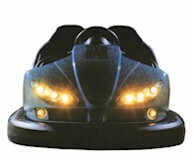 The high capacity of 60 riders in 20 large cars makes this ride an efficient profit-maker for either a park or traveling show. And, the hot-galvanized structure and AC frequency controled drive unit makes this a safe, dependable and low maintenance ride. Themed to any of our standard models or to your specific needs. Check out the new Rock-N-Roll theme. 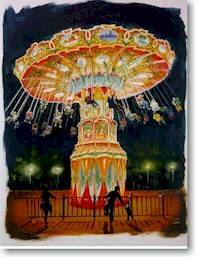 Available in 3 sizes this classic swing ride incorporates Bertazzon's timeless, 18th century Ventian scenery panels, hot-dip galvanized framework and a lift, drive and brake system controlled by a state of the art frequency converter. Scenery made to your specifications is also available to add a personalized touch. Chairs and the suspending chains are made of stainless steel for low maintenance, long life and prolonged beauty. The largest model offers seating for up to 42 persons and is also available as a trailer mounted version.